The Sunrise Soirée EP is a selection of songs from a Japanese full length CD of the same name that (pun intended) never saw the light of day. 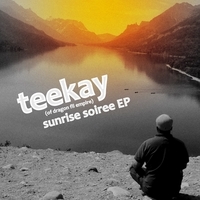 The songs Teekay selected for the EP had similar deep and introspective moods, tracks that would be ideal to play during the solitary hours of night... music to dream to. His vocals are meant to complement and not overpower the music, and DJ Nato sprinkles in smooth scratching here and there. There is also some wise words from the late Kirby Small. Look for a sequel EP with more tracks from the Japanese full length (tentatively titled Midnight Matinée) soon.